Ha! Got your attention, didn’t I? No, don’t worry, MM hasn’t gone X-rated. I’m referring to some friends of mine joining us (my girlfriend Irma and me) for a Burns Night celebration last night. They’d never been to a Burns Night before, had never eaten haggis, had only a vague idea of what tatties ‘n’ neeps were and had never even heard of skirlie. So Sanna, Joel and Karen were about to lose their haggis virginity. Of course, there are traditional ways to celebrate Rabbie’s birthday, now almost 250 years ago. But over the last few years we’ve been hosting small groups of friends for an annual Burns Night at my home and so we’ve developed my own traditional ways to celebrate. Every tradition was a novelty one day, right? Key thing: as much as possible of the food, drink and music on offer is to be Scottish. So we kicked the evening off with serving Scottish wine. Scottish what? Yep, wine, although not made from grapes. Scotland has a very interesting wine maker, located just south of Kirkwall on the Orkney islands, and it does my Dutch heart good to be able to say he is Dutch! Emile van Schayk established the Orkney Wine Co. a number of years ago and makes wines from a wide range of fruits, for as far as possible grown locally. We actually spent a good part of the day at his winery, talking and tasting, during our holiday on Orkney a few years ago, but that’s another story. Last night I opened a bottle of his gooseberry wine and I think it went down pretty well. Getting ready on the cooker in the mean time was a big pot full of potatoes and turnips, a pan with skirlie and, of course, two big fat shiny haggises! 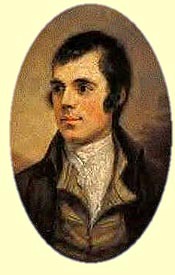 You can’t start dinner on Burns Night without reading some of Rabbie’s poetry; that goes without saying. Sanna is from Germany, while Joel and Karen are American, so I think I got away with reading “Address to a Haggis” in my very best imitation of a Scottish accent (if I didn’t, at least they kept their thoughts to themselves …..). The whisky bottle I had opened to accompany dinner was Compass Box’ “The Spice Tree”. A toast to both Robert Burns and John Barleycorn and people were ready to taste haggis for the very first time in their lives ….. I think they were a wee bit anxious about eating something that has a reputation of just being some cut up offal in a sheep’s stomach. But to their surprise (and my relief!) they really liked it! My suggestion to sprinkle just a bit of whisky over the haggis was enthusiastically tried out and approved (yes, I know this is sacrilege in the eyes of some, but I like it, so just stop me). Needless to say the haggis, skirlie and tatties ‘n’ neeps disappeared quite quickly. For dessert, we tried out something new (remember, every tradition has to start one day? ): a recipe for whisky and walnut tart from Mark Hix’ book “British Regional Food”. For the whisky I chose a Glenfiddich 15yo Cask Strength. Because it is a new recipe for us, I wanted to try it out with a whisky which has a relatively intense taste, but not too peaty or sherried. The tart came out really well and for next time I think I’ll try a more sherried whisky to add just a bit more body against the walnuts. Now if you expect me to rattle off the various malts we tasted after dinner, I must disappoint you. People liked “The Spice Tree” so much that we actually kept drinking it and, well, finished, erm, the bottle completely. I really like this malt, with the additional wood in the casks adding a fullness and complexity, with touches of polished wood, that are hard to find in any other malt. What a crying shame the SWA forced John Glaser to stop producing such a delicious and innovative malt …..
Oh, and what about music playing throughout the evening? All Scottish artists, of course and I wanted to go from traditional to more modern as the evening progressed. Starting with a CD from John McCusker, arguably one of Scotland’s finest fiddlers. Then on to Robin Laing’s rendition of ‘John Barleycorn’ (timed to coincide with our double toast, of course) and the rest of his ‘”Angel’s Share” CD. Then on to music from Capercaillie and finally the Cocteau Twins. So how did people feel about losing their virginity?